ACHT BRÜCKEN 2015 | "EIGHT BRIDGES" 2015 takes "Music. Politics?" as its theme, asking whether and to what extent new music has a political stance or is even itself a political act. Works by composers such as Louis Andriessen offer ample material for this lively controversy. Behind the scenes: Monica talks about her work with sound designer Frank van der Weij, La Girò, and the concerts in the Washington, D.C. area Festival. Subscribers can click here to read the digital edition. "Despite her degrees from Yale and the New England Conservatory, classically trained violinist Monica Germino wasn’t content performing centuries-old orchestral works. So, like Dylan at Newport in 1965, she went electric, commissioning her own model of electric violin and working with experimental Dutch composer Louis Andriessen. Tonight at Atlas, she’ll present “Road Maps and Diaries II,” a program that started as a one-night showcase of new music, improvisation, and installations with frequent collaborator (and fellow Netherlander) Frank van der Weij and has evolved into a touring production of unconventional performance and feats of sound design. Monica Germino and Frank van der Weij perform at 8 p.m. at Atlas Performing Arts Center, 1333 H St. NE. $20–$28.50. (202) 399-7993. atlasarts.org. Sound designer Frank van der Weij joins violinist, vocalist Monica Germino in a concert that features "electroacoustic innovations" of compositions by Louis Andriessen, Julia Wolfe, Michael Gordon and more. Part of Andriessen75. At the Lang Theatre. "Monica Germino (violin) and Frank van der Weij (sound design), Amsterdam-based collaborators whose paths have intertwined with Andriessen's for decades, perform a revolutionary take on the solo violin recital in a raucous and reflective evening for violin, electric violin, adapted violin, voice, electronics, installations, images, & sound design. ROADMAPS & DIARIES began as a single show in Amsterdam and has evolved into an ever-changing tour..."
"This presentation features Andriessen's XENIA, a three-movement piece for violin and voice, Julia Wolfe's with a blue dress on, Michael Gordon's INDUSTRY for adapted violin and electronics (2008), and Irish composer Donnacha Dennehy's Overstrung (2010). Presented by Atlas Performing Arts Center." 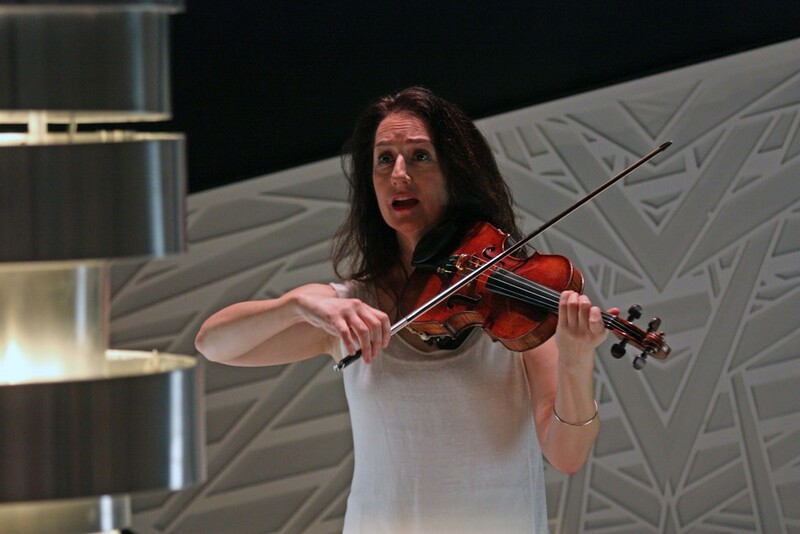 Monica Germino, violin/voice, EDGE Ensemble in Louis Andriessen's violin concerto La Girò. Damon Talley, conductor.